Your one-stop blog for a stocking-stuffer-a-day, featuring creative, fun, and (mostly) inexpensive stocking stuffer and small gift ideas. And remember, stocking stuffers aren't just for Christmas anymore! Although I've featured handmade journals from Etsy artists before, this one has a new twist that I just couldn't resist: it's a custom-made journal fashioned from vintage Scrabble boards, and you specify what the Scrabble tiles will spell out! Sara of the Re:Paper Etsy shop refers to herself as a "hackbooker", or to quote Sara herself, one who indulges in the "craft of guerrilla bookbinding, using found objects and fine papers to create mixed-media books, albums, and folding frames." Since I love both books and recycling, it doesn't get much better than this for me! 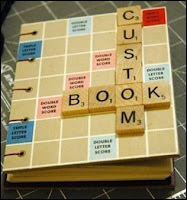 This particular custom Scrabble journal measures 4.5 x 5.75 inches, which should just work as a stocking stuffer. There's also a taller version available, as well as many other lovely journals, including a custom wedding journal, a journal made from a vintage Chutes and Ladders board game, and even one made from beer boxes! It's definitely an eclectic collection. I'm drawn to many of the designs, but I admit I keep coming back to that Scrabble journal. So what would yours say? I'm thinking "Book Lover", "Cat Lady", or one of Sara's own concoctions, which was "Word Nerd" (that one has since been sold, but she tells me she'll be putting another up for sale in the near future). If someone you know is a real Scrabble aficionado, "Scrabble Ninja" might be funny. That's what I love about Etsy; so many of its artists allow you to be part of the creative process too! I happened to see your blog and thought back to our stocking stuffers last year. My husband and I bought a Greedy Greedy game and gave it to the kids and a game each to our extended family. We had hours of laughter and great times Christmas night. It was a truly wonderful time. The best part was the manufacturer we bought them from seems to always give to charities so it was perfect tie in for the season! Jerry(my husband) bought them at www.highpointgames.com. They are under $10 so they were very affordable too. I hope you have as much luck with them as we did! 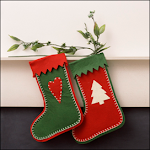 Don't think outside the box, think inside the stocking! Thanks to April from Sugar Daisy! All text content on these pages are copyright 2008-2010 Amy 's Stocking Stuffers and may not be reproduced, including electronically, without permission. Images are copyrighted by the artists and/or sellers of the items shown.